Toby's Plaza is a plaza, brilliantly designed by James Corner Field Operations. Toby's Plaza explores the contemporary meaning of architectural landscaping, with a focus on developing innovative approaches toward landscape architectural design and urbanism. Toby's Plaza has three distinctive, yet cohesive areas including: 21,000 sq. ft. open plaza, a 7,400 sq. ft. birch bar, and a 12,000 sq. ft. green space. 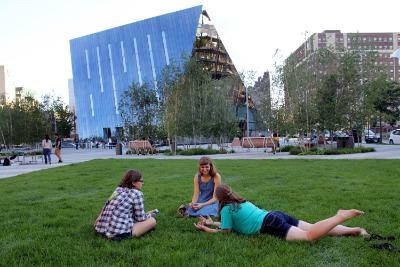 Toby's Plaza is a unique and distinctive environment that fosters the public intersection between the arts, technology, academia and fun. The concrete pavers provide a hardscape surface that has the ability to convert to a tent structure to host private events, public exhibitions and unique installations. The birch-bar provides shaded, casual seating for lunch or small discussions. From dawn to dusk, a visitor to the plaza can have fun, relax or be awed! Temporary exhibits, events and programs enhance our community and showcase the unique talents and intersections of the cultural intuitions and individual expression. See what's happening.